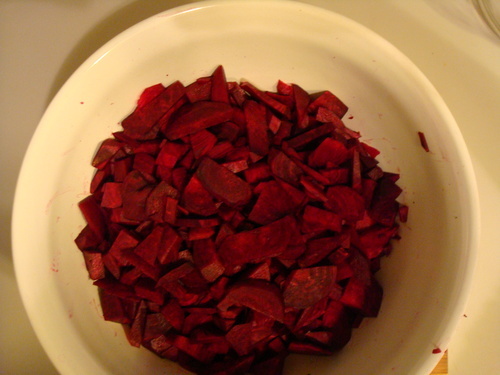 Sometime ago I read an article about beets boosting your performance and recovery. This video explains it pretty well. Basically beets make your body’s energy production more efficient. The more I researched, the more I found people talking about how they felt their running/biking/whatever improve. Cool. I went out and got some beets and made myself a salad. Delicious. Then I tried roasting them. Delicious. I stopped making them after that because BGE wouldn’t touch them and I didn’t like making two meals. Then some triathlete got sponsored by Biotta (a juice company), or tweeted about it or something like that. All of a sudden, BGE was all about beets and beet juice. Wonderful! They weren’t lying about the recovery benefits. Last year, it took me forever to recover from my fall marathon. I spent a lot of time in the pool doing laps, or on the recliner grumbling. This year, my recovery was a lot less painful and it didn’t take as long to get back up to my pre-race milage. 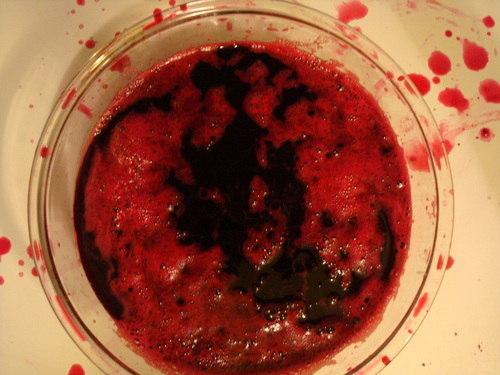 Beet juice is great, but it’s expensive. It’s seven dollars for a bottle that claims to contain 3 beets. Yikes. 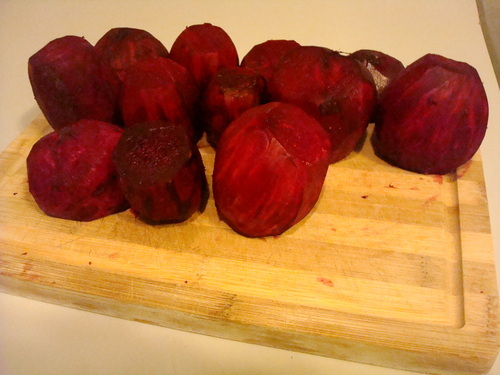 Beets are about $2.25 per bunch…that’s a more than a 3x markup! Well, I decided to make my own. It turned out to be pretty easy, if slightly it is time consuming. It’s a great project for a non-training day. disclaimer: roll up your sleeves and wear an apron, this stuff stains if you spill or splash. 1. Scrub the beets really well. Then cut off the tops and bottoms and peel. I guess you can cook and keep the greens if you want, but I don’t want. Then chop them all up into a big bowl. The smaller pieces, the better, but you don’t have to be super precise. 2. Place the kitchen towel over a separate bowl. 3. 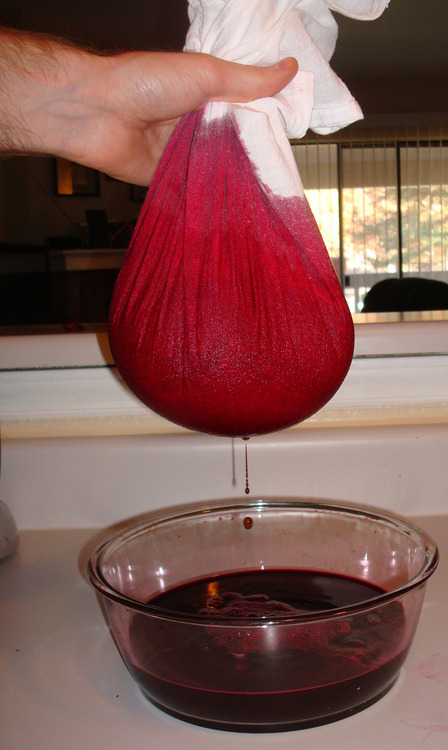 Working in batches, blend up all the beets with enough water to make the blender move smoothly. As you work, pour each batch into the bowl and towel. 5. Hold the cloth with one and and just start squeezing like crazy with the other. Squeeze squeeze squeeze and when you can’t squeeze any more, squeeze again. 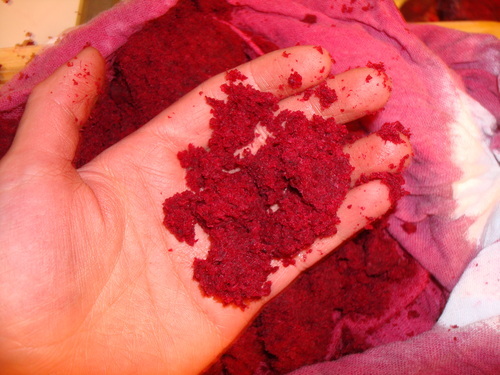 The only thing you want left in the cloth is a very dry pulp. 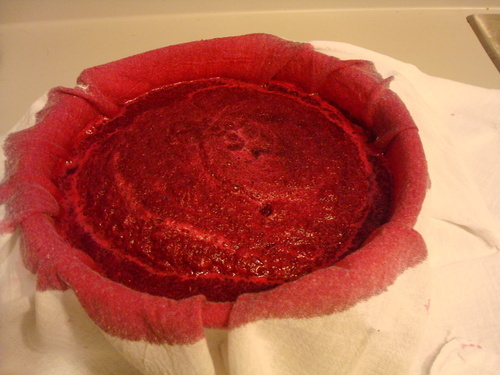 Store the pulp in an airtight container for later use. 6. 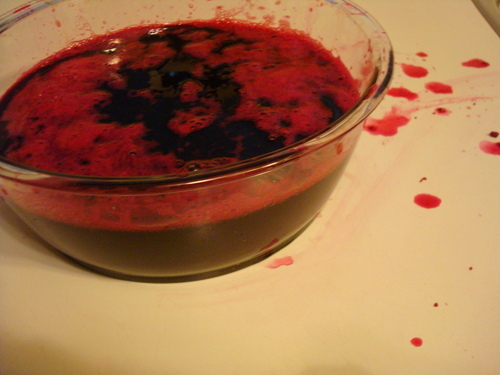 Transfer all the juice into a huge pitcher and store in the fridge. You can drink it straight up or mix it with something else. My favorite is: 1/2 a glass of beet juice, 1/2 a glass of seltzer, topped off with ice and the juice of a small lemon. It’s a very refreshing post run drink. Enjoy! 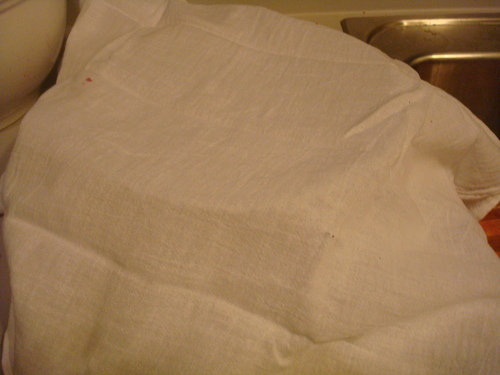 **You can use cheese cloth, or cheap cotton yardage from Jo-ann, or any thin kitchen towel. I like the kitchen towels because they’re reusable. The ones I found were called “kitchen sack towels” and they were $1.97 for a set of two. 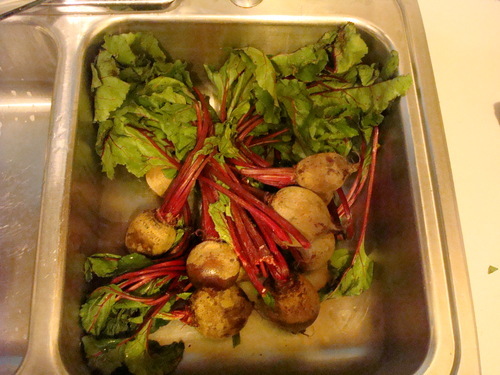 Just rinse them really well and toss them in the washer when you’re done juicing. I’m serious about rising. If you don’t rinse, whatever else goes in that load will get stained. You can find all this stuff at a grocery store or at any discount store.